A majority of journalists in developing nations has not had the opportunity to receive quality education in their profession and as a result not able to live up to this vital role. C4D journalism trainings are tailor-made depending on needs and means, but typically are built upon two full training weeks with a possibility for individual coaching afterwards. Trainings are highly interactive and combine classroom education with productions in the field. 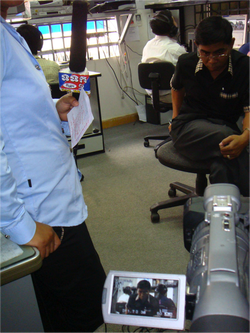 Below sample shows a two week media training on avian influenza for print media, radio and TV staff as provided jointly by C4D’s three consultants. Trainings on other issues follow a similar concept. Our consultants have conducted media training in politics and elections, HIV/AIDS, and many other current affairs such as environment, corruption and economic development. A. AI Training (sample) Week 1: In the first training week the trainees work in groups on a detailed assignment provided by each of the trainers beforehand. These assignments contain various media-products and simulate a situation in which a pandemic avian influenza outbreak occurs in the country. The first two days of this week the trainees will receive an update on AI by experts and a fresh-up on basic reporting skills and media ethics by the trainers, before preparing on the 3rd day the assignment for the following day. The last day of this week the trainers will analyze the problems, needs, questions the trainees face. The trainers will implement the results of the analyzed difficulties in the program for the second week. Week 2: Participants will receive advanced instructions about journalism skills and AI, learn the specific requirements and tasks for media during a crisis (outbreak), get familiar with various media tools to inform the public, exercise research and editing of productions, and implement the skills learned in their prepared assignments with assistance of the trainers.